Today is Easter Sunday in the calendar of the Western Churches (in the Orthodox Churches Easter Sunday will fall on 5 May). 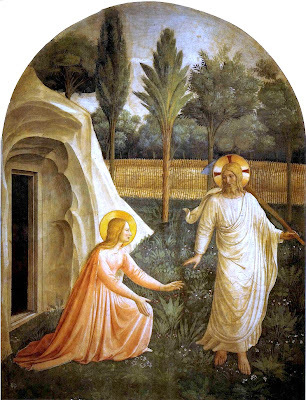 The story of Easter, of the events that happened on this day nearly two thousand years ago, belongs to two people above all others, Jesus of Nazareth and Mary Magdalene. This year Easter has been marked by special attention to Mary Magdalene. A relic of Mary Magdalene from Sainte-Maximin-la-Sainte-Baume in Provence has been touring the American Midwest. And to some stir in Britain, even outrage from the Church of England and the Catholic Church, Melvyn Bragg, who wrote the filmscript of Jesus Christ Superstar, has written and presented a BBC television programme called The Mystery of Mary Magdalene, its purpose 'to unravel the many questions surrounding one of the Bible's most enigmatic and controversial figures'. Melvyn Bragg's article in The Telegraph about his BBC 1 television programme can be read by clicking here. Lord Bragg does touch on many of the 'questions' about Mary Magdalene but he does so from an almost exclusively feminist point of view. Feminists - or perhaps one should just say women - in academic positions in British and American universities have for some time now been pushing Mary Magdalene as an overlooked, disregarded, suppressed, denied and slandered figure in Christianity. Their efforts should be welcomed, but it is simplistic and essentially wrong to say the depreciation of Mary Magdalene has been caused by a conspiracy of men against women. Rather Mary Magdalene has fallen foul of a profound argument over the apprehension of the divine, in which the established, ritualised and hierarchical Church requires that God be mediated through itself, whereas everything about Mary Magdalene suggests a more immediate and personal experience of the divine. Michael Haag's book The Quest for Mary Magdalene, which will be published in 2016, examines in breadth and depth the questions about this remarkable figure in Christian culture and belief. For more information click here.